In our beautiful cosy village, located in the heart of upper bavaria and only a 30 minutes drive from either the munich city center or the alps, the bavarian brewery culture and hospitality is maintained by our family in the seventh generation. 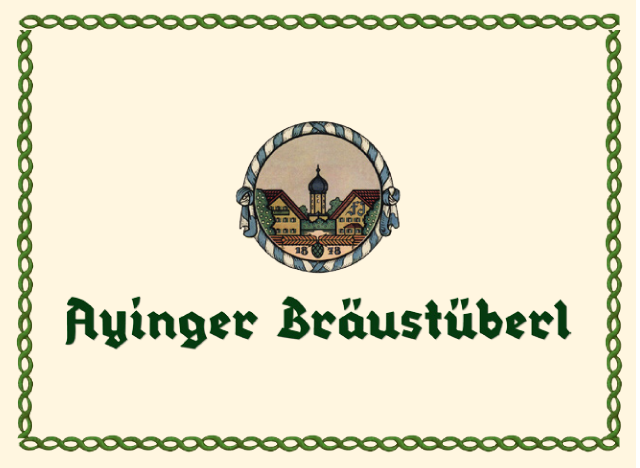 The Ayinger Brewery is known for more than 140 years for excellent beer specialties and is one of the most renown breweries in Europe. Enjoy our famous beer specialties, all brewed according to the purity law of 1516, freshly tapped in the Ayinger Bräustüberl, a traditional Bavarian beer hall right in the middle of the village. Next to the Ayinger Bräustüberl Brauereigasthof Hotel Aying is located; the hotel offers 48 beautiful and individual bedrooms. You’ll also find different and extraordinary locations for meetings and events. And last but not least the á la carte restaurant »August und Maria«, located in the Brauereigasthof, offers Bavarian cuisine at the highest level. Whatever you’d like to do in Aying: In our unique ensemble you can enjoy the traditional, authentic bavarian way of life.